Let’s take a walk together through the 23rd Psalm, as it talks about walking and the journeys people take. What is a shepherd? A shepherd is the caretaker for sheep. The shepherd is the one who is in charge of the flock, making sure all the sheep are fed, watered and remain safe and healthy. Psalm 23 is not really a funeral reading. Sure it mentions death, but it’s not about death. Psalm 23 is a psalm written in the face of great challenges. Of times of great suffering and oppression. It’s a Psalm that was beautifully written to capture the hope God offers in those times. To show us God is with us, through the good and especially the bad. What does a shepherd do, but take care of his flock. This is not a 9-5 job. 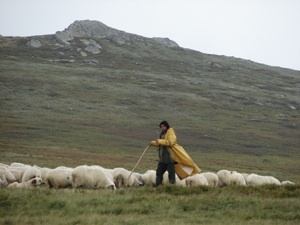 Being a shepherd means living 24×7, 7 days a week in the wilderness with the sheep. Being a shepherd means you don’t get the luxury of a bed each night. It doesn’t mean you get gourmet meals. Being a shepherd means you spend the nights fighting off enemies who try and attack your flock. It means making sure they have food, water, and a safe place to sleep. Being a shepherd is a hard job. A shepherd is not leading a glamorous life. It’s dirty, low paying, and not highly respected work. But it’s got to be done. Sheep are useful, they provide wool, they provide food. They are valuable items. So the shepherd needs to care for them. They don’t need to think about where they will eat or sleep, the shepherd is already on it. It’s taken care of. They just follow. God the shepherd provides for us. He is the one who guides us, the one who we follow. God, the shepherd will give us what we need. It may not be want we want, but God does provide. The shepherd knows what his flock needs. The shepherd will take them to green pastures so they can eat and get their rest. The shepherd will take them to still waters so they can drink and be refreshed in the safety of the slow moving waters. God can do the same. God, the shepherd will help us find the rest we need when we get too busy to know which direction we are going. God provides us with the water of life, as Jesus called himself when he talked to the woman at the well. God does not wish for us to go hungry or thirsty. God wants us to be cared for, to be strengthened in Him so we are able to continue the journey with Him showing us the way. That’s what God does. In God we are able to find rest for our souls. When we are troubled in our souls, God wants us to feel confident and safe in coming to Him for restoration. When we are restored through our trust of God to guide us, He will lead us down the right path so we may live fully in the love of God as shown to us in Jesus Christ. There are times when we struggle. There are times when we walk down the valley, and we feel alone. There are many different kinds of valleys in our lives. Some are short, some are long and feel like they may never end. And they can be scary places. Places where long shadows are cast by the mountains around us. Shadows that block out the sun from shining on us. Shadows that block what we can see lurking just outside our vision. And we wonder what threats may lie in there. It’s in these valleys where we feel uncertain, unsure of where to go. We may even be too frightened to move ahead, to make our way out of the valley. Yet we move on. We know if we stay down here, things won’t get any better. If we stay put, we will continue to live in fear or desperation. Everyone’s valley is different. Some may be much deeper than someone else’s. But it doesn’t mean your valley is any less of a struggle. There are many kinds of valleys. Valleys of addiction, family problems, struggles in the workplace or school, mental health issues, mourning the loss of someone close to us… and many more. If you are in a valley, there’s only one way out. We’ve all had our valleys. Some of you might be in one right now. If you are in a valley, then make your way out. What’s the way out? Climb. Life is full of peaks and valleys, and the only way to the peak is to start in the valley. Climbing is not easy work either. Think about the effort it takes to hike a trail to the top of the Highlands. It’s a tough, strenuous journey at times. But know you don’t need to make the climb alone. God is with us. God has surrounded us with people who love us. He has also given people gifts to be able to help us on our climb. People who are passionate to help people find their way out of their valleys. And God himself is there. Comforting us by continuing to show us the way. God fills our lives with hope, by reassuring us that we are His children and that He will take care of us. By letting us know that because He sent Jesus Christ to show us the way, to show us we are cared for eternally if we choose to follow him. God blesses us abundantly. The people who try to keep us in the valleys, God shows to them how much He loves us by continually offering us blessings. Imagine how frustrating that must be for them! No matter how hard they try to keep us living in fear, God continually blesses us and comforts us. Sometimes it means they will try harder to keep us down. To pull us off the mountain and keep us from reaching the peak. But they want a peak. No one wants to stay in the valley forever. So God blesses us right in front of their eyes. God wants our enemies to know how much love He has to offer. He wants them to know they can make it out of the valley too. He wants them to know they can be blessed as well. All they have to do is turn to Him. To learn about Jesus Christ and turn and follow him, and they too will find their own way out of the valleys of life. Living a life with God is one of great blessing. Will it eliminate the valleys? Of course not. But what it does is help us through them much more confidently, filled with much more hope for the future. Because we know, no matter what happens, God is with us, and we are with Him. We are with Him forever. Even death will not keep us apart. In the Gospel of John, we heard these words from Jesus when he was asked to tell the Jewish leaders plainly if he was the Messiah. It comes back to the shepherd. The one who knows the pathway through the valleys inside and out. The one who will lead his sheep onto better trails. A better life with hope for life eternal in His glorious kingdom. All we need to do is follow the shepherd, and we a free to fear no evil.